Los Angeles-based Diagnostic Automation/Cortez Diagnostics, Inc. offers an AMA IFA Test Kit (Antimitochondrial Antibody) Immunofluorescence Assay which is a pre-standardized IFA Test Kit designed to detect the presence of mitochondrial antigens (MA) in human sera.ï¿½ The AMA IFA Test Kit is a laboratory diagnostic aid, and by itself is not diagnostic.ï¿½ Positive MA may be found in diseases other than primary biliary cirrhosis.ï¿½ It is therefore imperative that MA results on this IFA Test Kit be interpreted in light of the patient's clinical condition by a medical authority. On this AMA IFA Test Kit, a positive control, negative control, and a buffer should be run with each IFA kit.ï¿½ It is recommended that one read the positive and negative controls on this IFA Test Kit before evaluating the AMA IFA Test results.ï¿½ This will assist in establishing the references required to interpret the IFA Test Kit sample.ï¿½ A negative control on this IFA Test Kit is characterized by the absence of fluorescent staining in the proximal and distal tubular epithelium, and gastric parietal cells.ï¿½ A positive control on this IFA Test Kit is characterized by apple-green staining in the proximal and distal tubular epithelium, and gastric parietal cells, with a staining intensity of 2+ to 4+.ï¿½ The intensity of the observed FITC fluorescence on this AMA IFA test kit may vary with the microscope and filter system used. 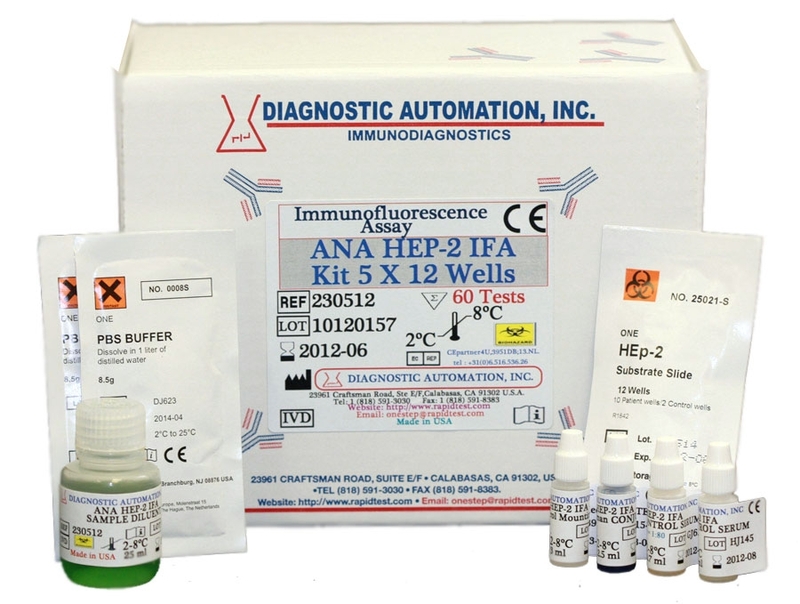 Along with this AMA IFA Test Kit, Diagnostic Automation/Cortez Diagnostics, Inc. offers an AMA IFA Test Kit Slide Package (SP) and several other ELISA/IFA Kits - some of those include, ANA IFA Test kits, ATA IFA Test Kits, DNA IFA Test Kits, Epstein Barr IFA Test Kit, FTA IFA Test Kits, HSV IFA Test Kits, and Toxoplasma IFA Test Kits.ï¿½ For more information about these IFA Test Kits, or any ELISA Test Kits or Rapid Tests, please contact our Customer Service Department.